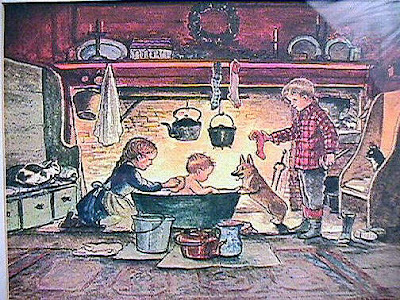 and I'm incredibly beat, so I thought I'd just share with you a few of my favorite Tasha Tudor illustrations. I'll save making a bigger post for tomorrow! "Tasha Tudor was born in Boston, Massachusetts as Starling Burgess. She was originally named after her father, the naval architect W. Starling Burgess, known as "the Skipper". As he was an admirer of the War and Peace character Natasha, his daughter was soon re-christened, and the name was eventually shortened to Tasha. When socializing with her mother's friends, Tudor was usually introduced as "Rosamund Tudor's daughter, Tasha", leading others to believe that her last name was Tudor. Liking the sound of it, she adopted the name and eventually changed her surname legally following her first divorce. She married Thomas McCready in 1938 in Redding, Connecticut. Tasha and Thomas McCready purchased a large old farm in Webster, NH., where four children, Bethany, Seth, Thomas, and Efner, were raised. 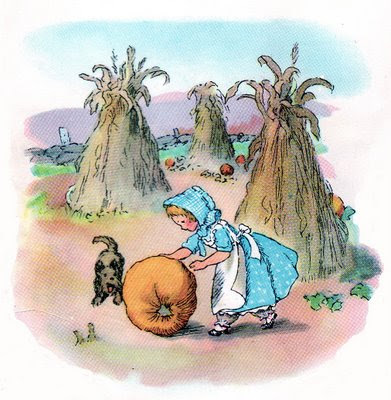 Her first story, Pumpkin Moonshine, was published in 1938, as a gift for a young niece of her husband. They were divorced in 1961, and her children legally changed their names from McCready to Tudor. A later marriage, to Allan John Woods, lasted only a brief time. 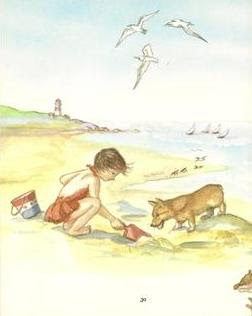 Tasha Tudor illustrated nearly one hundred books, the last being Corgiville Christmas, released in 2003. 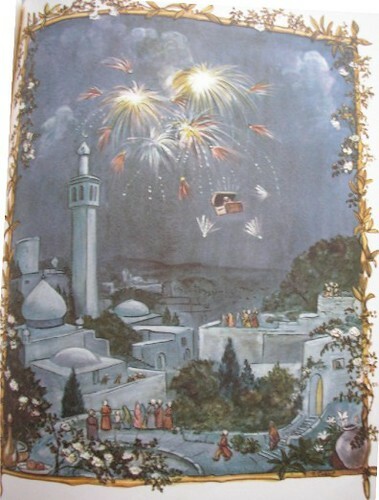 Several were collaborative works with a New Hampshire friend Mary Mason Campbell. 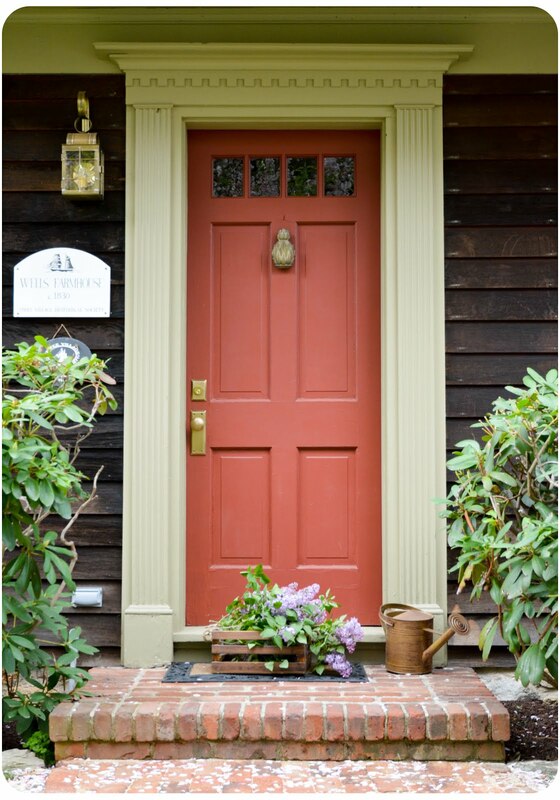 Tudor lived in Marlboro, Vermont in a house copied from that of other New Hampshire friends Donn & Doris Purvis. Her son Seth built the replication and lives next door with his family. 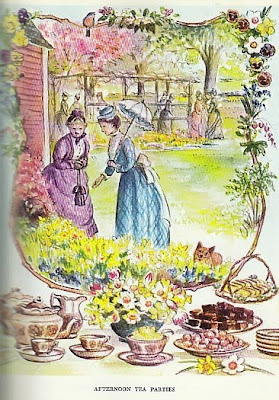 It is documented in Drawn from New England, and in The Private World of Tasha Tudor. Mother and son worked closely on family endeavors. She died on June 18, 2008 in Marlboro, Vermont"
these are so sweet:) thanks for sharing! Oh I love Tasha Tudor's work. Such pretty scenes. I live in New England and I love it too. Will have to check out more of your blog posts. Thank you for this post. 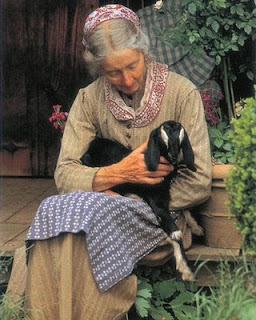 I love everything about Tasha Tudor, most of all her creative and loving soul. 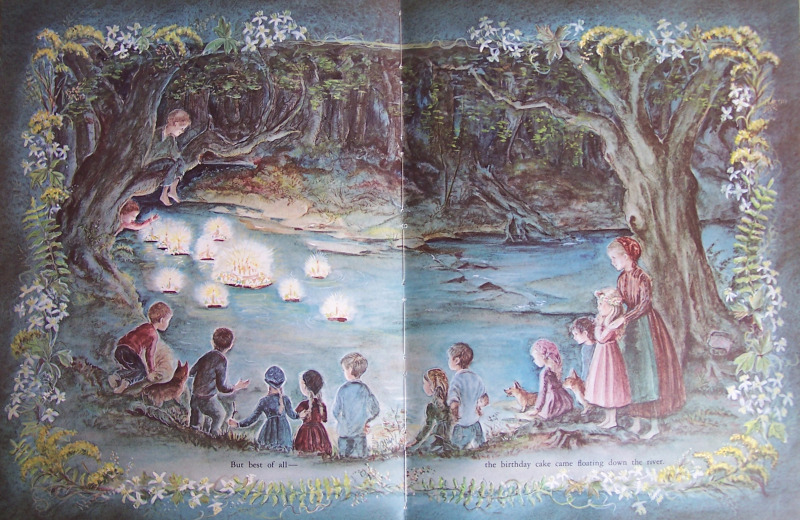 My favorite story of hers is where she recounts sending the candles and birthday cake down the creek for her daughter, like in the picture you've included here. I wrote her a letter, and the day before I wanted to send it I look up her address...and found the news that she had just died. I was very sad, and wished I had written to her earlier. She gave so much beauty to the world and won't be forgotten. i love tasha tudor too! one of these days very soon i am going to be making that mac and cheese on your sidebar. every day i look at it and think....yummo!!!! I love Tasha Tudor. 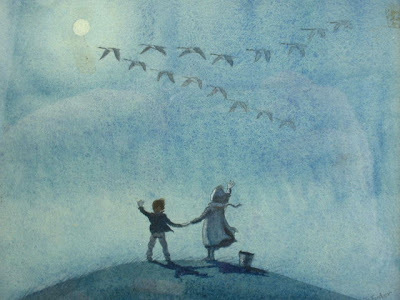 Her paintings are so comforting. Glad you like them too. These are wonderful! I have loved Tasha Tudor's work ever since I was a little girl. Take Joy! 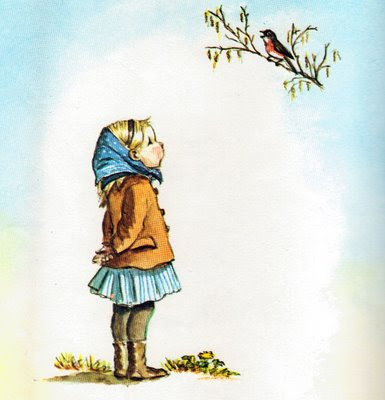 was my favourite Christmas collection, and I adored my hardcovers of The Secret Garden and A Little Princess, illustrated with her beautiful paintings. 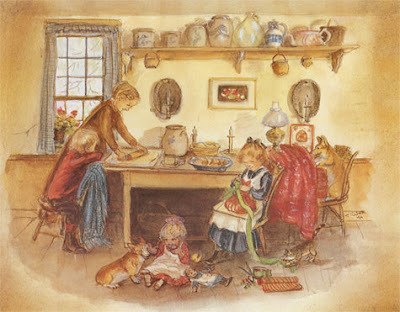 I just love Tasha Tudor's simplicity and her beautiful drawings. What talent.